JEFFERSON COUNTY, NEW YORK ALHN: Welcome! The Pioneer Portraits Project, a website under development since May 2001 showcasing old photos and sketches of people who were either born in or who settled in Jefferson County prior to 1865, recently added its 1,000th portrait! Access the latest additions to the Pioneer Portraits Project from the "County" page. If you would like to donate a picture, please send an email to the coordinator. Boni Shafer and her team have built an invaluable site for researching your ancestors in northern New York, including burial listings (photo available for some) and directions to cemeteries, as well as vital, military and census records. This site is updated regularly. Check it out, and check it often! Be sure to visit Fultonhistory.com and Northern New York Library Network for millions of searchable historic newspaper articles pertaining to Jefferson County and the surrounding areas—all free! 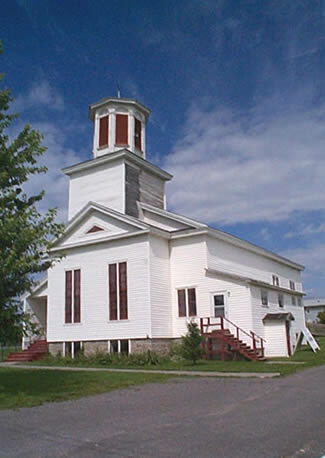 Honeyville Baptist Church, Town of Adams, rebuilt in 1838. Your suggestions for improvements or additions will always be welcome, simply email the coordinator!